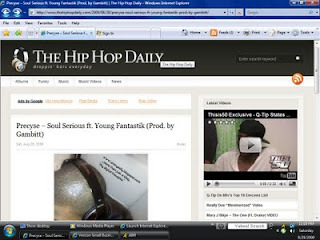 Check out the lil homie Precyse's track called "Soul Serious" Feat.Young Fantastik produced by me. Shout out to the homie GeOh by the way for the Big L cut ups. Ol'boy got his mind right for someone that is only 22, got his hands on many skills. Look out for Precyse's project "Before I Disappear" coming soon...maybe sooner than you think. I should have a few bombers on there as well with this one. I got a sneak peak at a few gems already. Def. good hip-hop, seriously. Lyrical content at high-levels...content itself is basically real talk at its realest. Meaning its the true struggles, positives and negatives but all real. You'll see.